On 71st death anniversary of Mahatma Gandhi on Wednesday, Hindu Mahasabha celebrated it on the different mode. Hindu Mahasabha’s National Secretary Puja Shakun Pandey celebrated Mahatma Gandhi’s death anniversary as 'Shaurya Divas' as Nathuram Godse assassinated him. 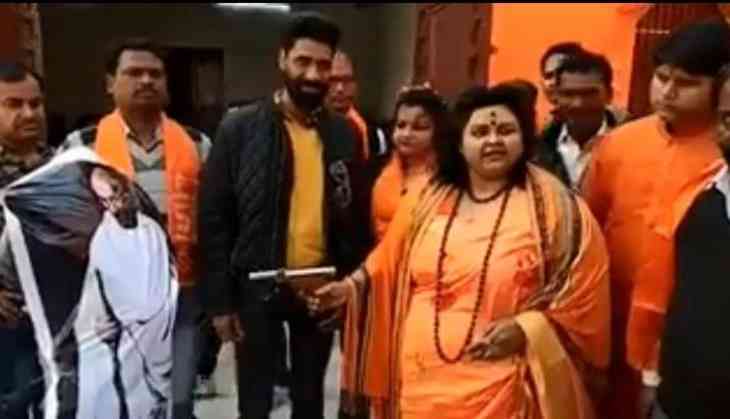 A video of Hindu Mahasabha leader shooting at the Gandhi effigy, to celebrate the occasion, has gone viral on social media. The Hindu Mahasabha celebrated January 30 as ‘Shaurya Divas’ in the memory of right-wing leader Nathuram Godse, who had assassinated Mahatma Gandhi on this very day in 1948. In the video, it can be seen, after Pandey shoots at the effigy, ‘blood’ came out of it. According to IndianExpress, Pandey also distributed sweets among her supporters and fellow Mahasabha members. Pooja Shakun Pandey, wearing saffron attire shot at an effigy of Gandhi with an air pistol and garlands his assassin Nathuram Godse. As soon the video went viral on social media, police have registered cases against 13 people associated with Hindu Mahasabha, including Pooja Shakun Pandey, no arrests have been made so far. “Today on the occasion of the 71st death anniversary of Mahatma Gandhi, workers of Hindu Mahasabha fired at the effigy of Mahatma Gandhi. The incident took place in a house in Naurangabad locality of the city. Later, the video of the event went viral on social media,” Senior Superintendent of Police of Aligarh Akash Kulhary told PTI. The police are conducting raids to nab the accused persons.